All I found funny except #1, because the observation doesn’t seem that sound – if memory and google image search are to be believed, even when an animal cracker’s outline is blobby there is usually lots of detailing to make it clear. These ones look like they have already been Shirley Templeized. Arthur, Well, those are store-brand “animal cookies”, rather than canonical Barnum and Bailey Animal Crackers. A polar bear with several diseases. Bi-polar at least, probably multi-polar bear diseases. Why is Rob wearing a propeller beanie? About the Swiss Army Cot, Wayno writes: Coincidentally, the soldiers’ last names are Toothpick, Tweezers, Nail File, Corkscrew, Can Opener, Screwdriver, Awl, and Fish Scaler. Swiss military personnel also have an extra leg joint for enhanced foldability. And I don’t see a Rob or a propeller beanie . . . ? Swiss Army looks “bizarro” to me because it appears the men are levitating. What are their heads resting on? Aren’t they cold, with the blanket only covering their legs? Why are they in full uniform, including two with hats, to sleep? You don’t fold out all the blades of a knife unless you are taking a promotional photo, and even then you find you sometimes can’t open all the blades at once. And it’s the cot that’s the Swiss Army variety, so it should fold out, so WHAT ARE THEIR HEADS RESTING ON?? That 1-2-3-4 is his password is not the joke in the Cornered, it’s just an old cliché; it’s the bizarre juxtaposition of this old cliché on this police line-up gag (another cliché) that made it liquid-through-my-nose laugh out loud (ltmnlol) for me. Not only does the witness not seem to get the concept, focusing on the wrong thing, what he does come up with in the end bizarrely does circle back to the concept in question here: they are obviously criminals to be in a police line-up, and while I don’t recognize any of them, they did just steal my password, the criminals! I actually zoomed way in to read his shoulder patch. It says “Rob” if it says anything, as far as I can see. I’m also curious why he’s wearing a janitor’s uniform rather than police, in addition to the weird hat. I read the patch as: “Polic-” (cut off at edge). Is the first on a T-shirt yet? Actually, I’m reminded of the old Carvel ice cream cake whale-shaped mold base used for multiple cake designs, most rather still vaguely whale-shaped in the end. Most of the people in a police line-up are not criminals. In a photo array they’re probably all criminals, but in a lineup, most of them are cops. As of last summer Barnum’s Animals crackers are no longer in cages. Stauffers, a company in PA and Nabisco both also make animal crackers and I have read an article (don’t remember how far back or where) that Stauffers claims to have invented them. It doesn’t surprise me that Nabisco’s animal crackers are not the original. Nabisco’s Oreo cookies are a knock-off of the original Hydrox by Sunshine, and I for one think Hydrox taste better. Are animal crackers really ‘crackers’? 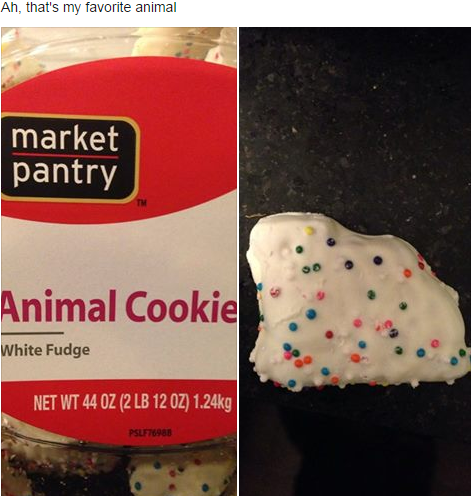 I thought they were cookies . . . According to Wikipedia (usual caveats) the type of dough makes it a cracker in spite of the sweetness. I suppose the line, ‘Animal cookies in my soup’ wouldn’t sound as appetizing . . .
Maybe in English soup ? There, “crackers” are those things you pull at Christmas and surprises pop out. Cookies are “biscuits” . . .
Mark in Boston – my cousins always had Hydrox and never Oreos. Hydrox were kosher, Oreos were not.